Adobe has posted Lightroom 1.3, which includes full support for Mac OS X 10.5 Leopard (Version 1.2 had problems with the Print module). The update also adds Raw image support for a number of recent digital cameras, including Canon’s 1Ds Mark III and PowerShot G9; Nikon’s D3 and D300; Olympus’ E-3 and SP-560 UZ; and Panasonic’s DMC-L10. On the Adobe Labs site, the company also released a preview of the upcoming Lightroom Export SDK, which will let developers create custom export plug-ins for Lightroom. 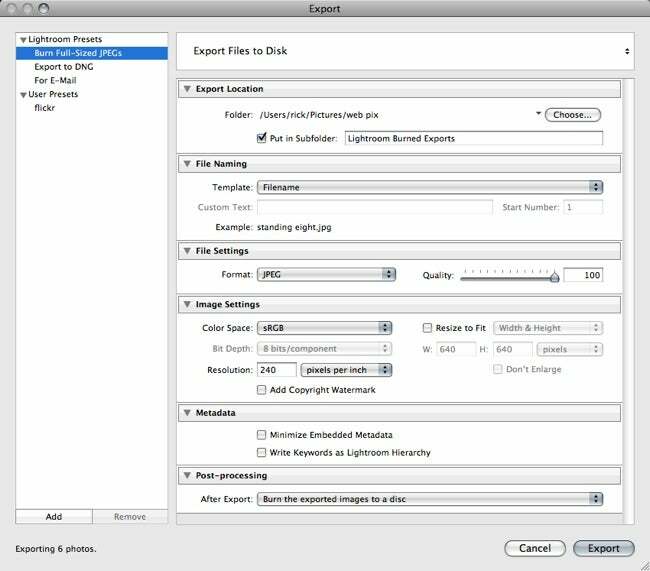 The SDK includes sample code for creating an export plug-in for Flickr, among other things. Probably in anticipation of this, the export dialog in Lightroom has been restructured slightly as well (see below). The new Raw formats supported are part of Camera Raw 4.3, which was announced simultaneously with Lightroom 1.3. If you’re using Photoshop CS3, you can update to Camera Raw 4.3 by using Adobe’s software update tool via the Help - > Updates menu.